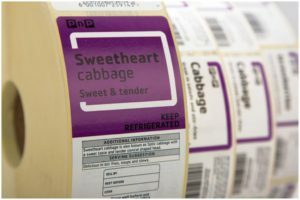 Whether you’re creating dairy labels, food labels, condiment labels, fresh produce labels or meat labels, they will all need to stand out from the crowd as well as deliver relevant, informative information. These packaging labels range from barcoded stickers to large branded labels. Fresh Produce Labels: The design of food packaging labels and in particular Fresh Produce Labels plays a very important role in identifying the fruit or vegetables as conventionally grown, organically grown or genetically modified. The way to identify this is through reading the PLU (Product-Look-Up) code. For conventionally grown produce there will only be 4 numbers in the PLU code. If there are 5 numbers in the code and the code starts with 8 then the produce has been genetically modified. If there are 5 numbers in the code and the code starts with 9 it means that the produce has been organically grown. Fresh produce labels and stickers are usually made with food grade adhesive to stick directly to the skin of the product, but the label itself is not usually edible. Dairy Labels: As dairy often forms one of the most common allergies in children and adults, dairy producers have to be extra vigilant when creating their food packaging labels for their dairy products. Ingredients for which the source is a major food allergen such as dairy has to be clearly marked on all dairy labels. Dairy ingredients must be identified in addition to the name of the ingredient in a statement that includes the word “contains.” For example, whey may be listed on the label as “whey (milk),” and other packages might say, “Contains milk and soy.” If the product is produced in a factory together with dairy, or the equipment that is used is also used for dairy then this too needs to be stated on the label. This type of regulation is also required for nut products, fish products and shellfish products. Meat Labels: Most meat labels should make clear how the animal was raised in order for the consumer to make an informed decisions as to the product they’re buying and what pesticides, herbicides, hormones etc may or may not be contained in the meat. Grass-fed is a common term that is found but some farmers also state this on their food packaging labels even if they grain-feed the animals in the last few weeks. If you want 100% grass fed meat then look out for the 100% grass-fed on the label. Free-range is another term that is often found on poultry labels and means that the chicken has been raised in barns and given access to the outdoors. The term free-range however differs from one farmer to the next so it’s quite difficult to know how “free” the birds really were. The same applies to organic meat and should be investigated further in order to find out whether the farm has been organically certified. (Which means it is audited for organic practices each year.) Nevertheless, this information should be stated on the food packaging label of any meat product. As can be seen from the above, food packaging labels are more than just branding and pretty colours. They allow the consumer to make educated decisions about the food that they buy and ultimately consume. As society becomes more and more vigilant of what goes into their bodies it will probably become even more regulated as to what needs to be stipulated on each food packaging label. Food packaging label manufacturers and designers need to stay abreast of the current food packaging label regulations that may affect the design and print of their labels. Read more about creating effective food packaging labels here as well as labelling your unique container. In order to make sure that all the necessary information is printed on your food packaging label it is important to partner with a label manufacturer that has many years’ experience in the business.